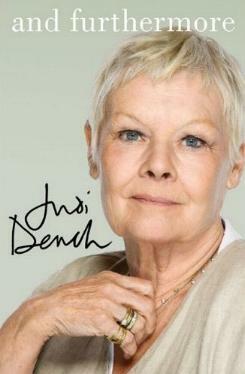 Love, love, love Dame Judi. She's so fun, not to mention a brilliant actress. She can play anything from a queen to a teacher, a comedic role or a demanding Shakespeare character. Although there have been other books written about Judi Dench, this is the one that's most personal. She starts her book with her growing up in York, her doctor father who loved acting, and how she got into a few school plays, and finally, her start in London's Old Vic as Ophelia. Reading her book you can almost hear her distinctive voice in the narration, which for me, was quite comforting. Her recollection of working with so many talented rising stage stars at the time (Richard Burton, Sir John Gielgud) and their work ethic, is impressive. Dame Judi's private life is almost unheard of, so for me, it was a welcome surprise to read not only about her marriage, but also about her daughter and grandson. Perhaps her work both on stage and in film and television got the most attention, the way it should be. She has an extensive repertoire, and the volume of her stage work is staggering, even to this day! Her foray into sitcoms was with her husband Michael Williams in A Fine Romance. That was followed by the charming As Time Goes By with Geoffrey Palmer. Dame Judi also had a stint at directing a few plays. Not the easiest job but one she came to cherish. She's known more recently for her films like 'M' in the Bond movies, Mrs. Brown, Nine, Shakespeare in Love (Oscar! ), Tea with Mussolini, Chocolat, The Shipping News (a gem of a movie), Iris, Ladies in Lavender, Mrs. Henderson Presents, and Notes on a Scandal. See the Chronology of Parts at the end of the book for a complete list of her work. Such a classy and professional artist is Ms. Dench. Conclusion - A delightful romp through this lovely lady's theatre and film career. An honest account.